Fairytale Legends: Hansel & Gretel is a NetEnt slot with 5 reels and 10 paylines that is playable on all devices (pc, desktop, tablet and smartphone) inspired with one of our favorite childhood stories – Hansel and Gretel. Get the best cheats, new free spins, no deposit bonuses and match bonus offers for NetEnt’s astronomically awesome new slot Fairytale Legends: Hansel & Gretel! Fairytale Legends: Hansel & Gretel is a five-reel, 10-payline slot machine that was released in 2017 by NetEnt. Of course, you know the story: two adorable German children, the main characters in the popular fairytale who are about to discover a house made of confections in the woods near their house. Symbols on the reels include different coloured candy, birds, Hansel, Gretel, treasure chests scatters and the Fairytale Legends logos. The following are the best NetEnt Casinos selected for you by the BetAndSkill team. Choose your favourite offer, click the 'Claim' button and enjoy your casino bonus or no deposit free spins in few simple steps! Alternatively, you can visit our No Wagering Casino Bonus section! One of the main features of this slot are The Stacked Wild symbols, who can appear on reels 2 and 4 in the main game and additionally on reels 1 and 5 during the Stacked Wild Re-Spin. Whenever Stacked Wild symbols land covering the entire reel, a Stacked Wild Re-Spin is awarded. Fairytale Legends: Hansel & Gretel comes with 3 random features which can be triggered, randomly of course, in the base game. These 3 features are: Fairy Wonder Spin, Fairy Surprise and Fairy Wild Spin. A random cluster of 5-9 FL logo symbols (Fairytale Legends symbols) are placed on reels 2nd, 3rd and 4th with reel 3 always being fully stacked with FL logo symbols. The reminder are placed randomly on reels 2 and 4. Receive two full stacks of wilds on any reel apart from the third one, which will award a Stacked Wild Re-Spin. This nice little feature activates randomly at any time after a non-winning spin. One symbol is randomly chosen and the fairy is turns all other symbols on the screen into the same symbol(except the FL symbol) until a you grab a win! Fairytale Legends: Hansel & Gretel also comes with 3 bonus features. When at least three Treasure Chest Bonus Symbols appear on the 1st, 3rd and 5th reels, one of the 3 available bonus features will be activated. You can get either a Candy House Bonus, Free Spins or a Coin Win. The Coin Win Bonus Feature guarantees an instant coin win which is your current bet multiplied by x15 and the Free Spins feature rewards you with 10 free spins. Look out for more bonus symbols landing on the reels as 1, 2 or 3 will give you 2, 4 or 10 extra free spins respectively. Look out for Stacked Wilds appearing fully on reels 1, 2, 4 or 5 as this will trigger the Stacked Wild Re-Spin feature. This can lead to wins of up to 400 times your stake on every free spin. Candy House Bonus Feature transfers you to the witch's Candy House where you will be able to pick and choose three of the 15 different candies, all hiding random multipliers from x1.2 and up to x120. After you've picked all three candies, you'll have to make a choice to either take their average guaranteed multiplier or keep picking until you get one of them at random. 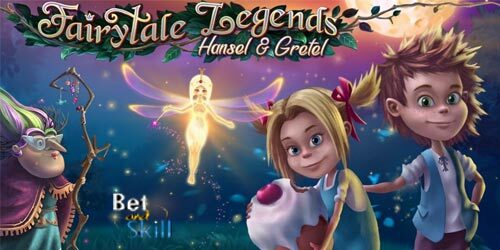 Fairytale Legends: Hansel & Gretel is a medium volatility slot machine with an RTP of 96.71%. "Fairytale Legends: Hansel & Gretel slot - Free Play - Cheats - No deposit bonus - Free Spins"